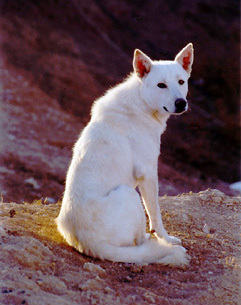 The Canaan Dog possesses extremely keen senses of hearing and smell, and he can detect approaching intruders from a considerable distance, becoming instantly alert. 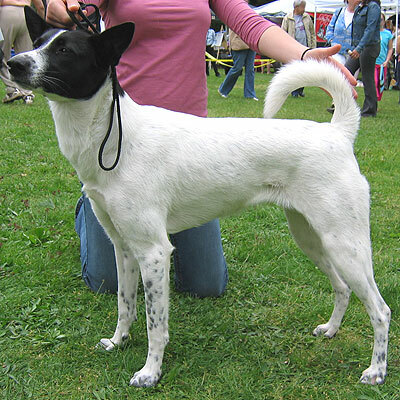 He is an intelligent, trainable breed whose tracking ability is excellent. 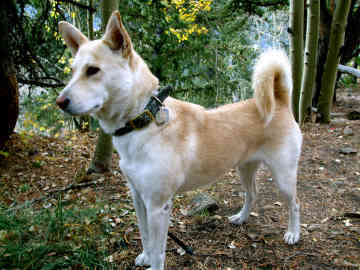 When raised with children and other pets, he becomes a devoted family companion and natural watchdog. 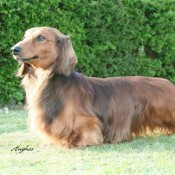 He is aloof with strangers, inquisitive, loyal, and loving with his family. 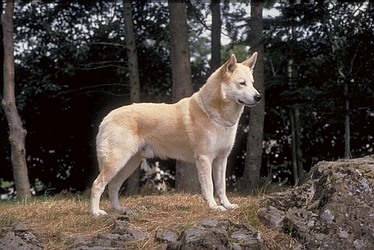 Because of the strong "denning" instinct of their recent semi-wild past, the Canaan Dog is naturally clean and easily housebroken. He does not require an excessive amount of exercise. 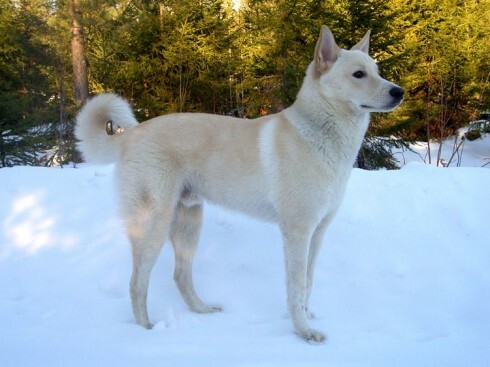 The Canaan Dog is described as alert, vigilant, devoted and docile with his family. Medium sized, well balanced, strong and square. Marked distinction between sexes. 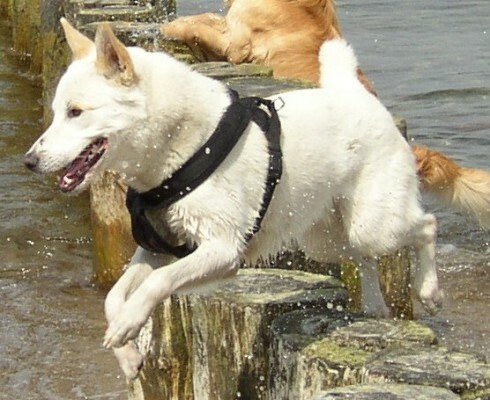 Agile, alert and highly intelligent. Confident and vigilant. Aloof with strangers. 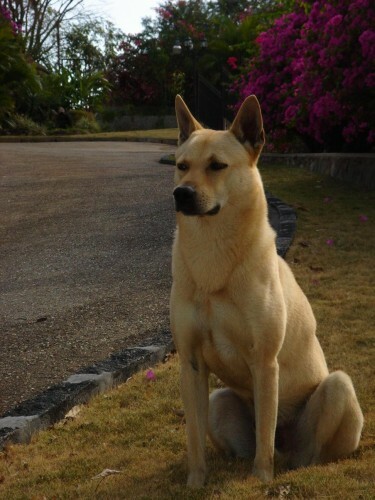 Steady and loyal to owners. Skull Well proportioned, wedge shaped of medium length, appearing broader due to low set ears. Skull somewhat flattened between ears. Stop shallow but defined. Length from muzzle to stop approximately equal to length from stop to occiput. Nose black. Lips tight and well pigmented. Dark, almond shaped and obliquely set with black rims. Medium sized, erect and set low with broad base and rounded tip. Jaws strong with a perfect, regular and complete scissor bite, i.e. upper teeth closely overlapping lower teeth and set square to the jaws, level bite acceptable. Muscular, well arched, of medium length without throatiness. Well laid muscular shoulder, elbows close to body. Medium boned. When viewed from the front forelegs straight. Pasterns slightly sloping. Square, withers well developed, back level, loins muscular, chest deep and of moderate breadth, ribs well sprung. Belly well tucked up. Powerful, broad muscular thighs, hocks well let down. Legs straight when viewed from behind. Strong, round and cat like with hard pads. Set high, thick brush carried curled over back when trotting or excited. Outer coat dense, harsh and straight of short to medium length. Undercoat close and profuse according to season. 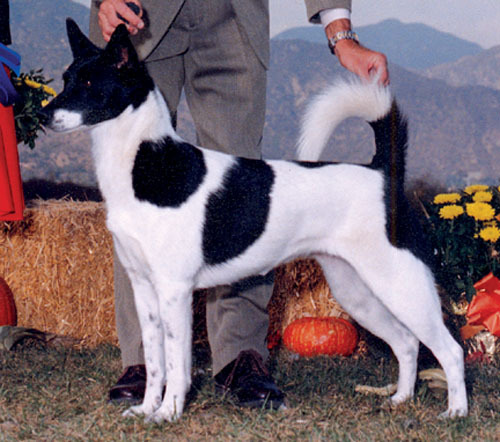 Sand to red-brown, white, black, or spotted, with or without a symmetrical black mask. 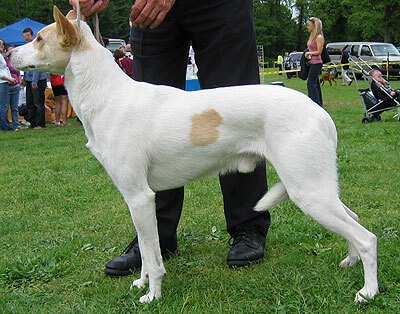 White markings permitted on all colours. Grey, brindle, black and tan or tricolour undesirable. Height 50-60 cms (20-24 ins). Weight 18-25 kgs (40-55 lbs).